It's 23:57 in Klamath Falls, USA right now. 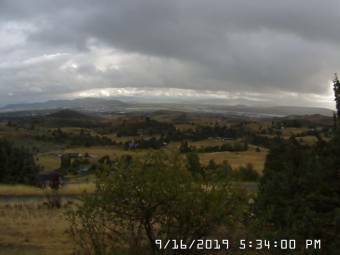 Plum Hill A webcam in Klamath Falls, Oregon with image archive, weather data and timelapse videos. Lake of the Woods, Oregon: ORE140 at Lake of the Woods, 24.4 miles away. Lava Beds National Monument, California: Lava Beds Visitor Center, 36.3 miles away. Hilt, California: I-5 California at North Hilt, 45.9 miles away. Medford, Oregon: Medford Weathercam, 56.3 miles away. Weed, California: I-5 California at Weed Airport, 63.6 miles away. Chemult, Oregon: US97 at Chemult, 68.5 miles away. Paisley, Oregon: ORE31 at Paisley, 70.8 miles away. Applegate, Oregon: Tallowbox Mountain, 70.9 miles away.